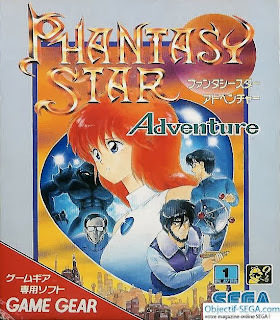 Last week around this time, I published a post devoted to five of my favorite pieces of Japanese Game Gear box art. Today, I'm publishing another. Don't worry, this one features absolutely no purple-tinged cover illustrations--although it does feature a few pink ones. 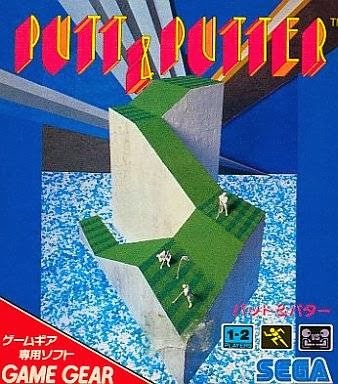 Nazo Puyo: Aruru no Roux--There's a whole lot to like about this piece of box art, in my estimation. First, there's the giant photo of a plateful of curry. Then, there are the illustrations that depict the titular Arle (Aruru) and her pal Carbuncle as chef and, uh, a curry-loving flying-carpet rider. Finally, there's the flashy and fun logo. 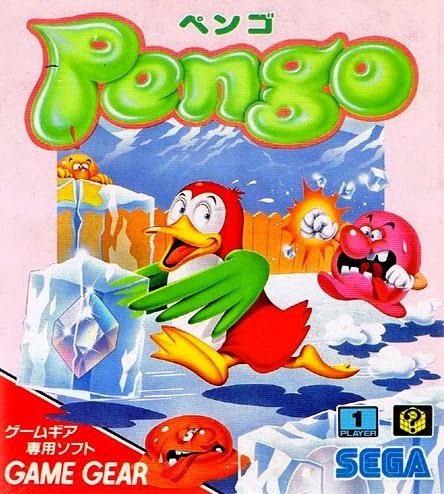 Pengo--OK, so the bird in the cover illustration above looks more like a duck than a penguin (and I'm pretty sure the protagonist of this classic game is supposed to be the latter), but the rest of it is so cool that I'm giving it a pass. Psychic World--I've never much cared for this title's gameplay (or graphics, to be completely honest), but I very much care for its cover imagery. That its border is a pleasant shade of pink just adds to its allure in my mind. Putt & Putter--I know what some of you are thinking in regard to this selection: "It looks like one of those nasty posters that appear in movies from the 1980s!" I can't disagree with that assessment. Still, it appeals to me. I'm guessing it's because of that retro-tastic logo. That bottom picture looks like the punishment for golfers in hell. Oh, my! I didn't know this was even a thing before now, Michael. How weird? What on earth were the folks at SoA thinking with this one, I wonder? Glad I could introduce you to it, Anne! 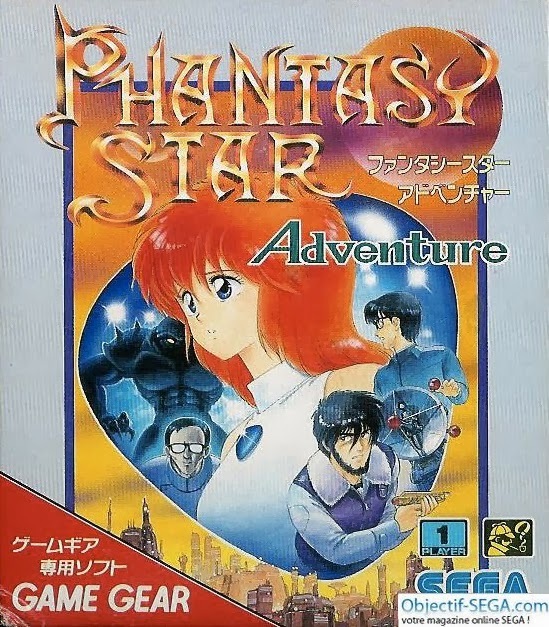 Also, would it shock you to hear I bought the game chiefly because of its box art? Haha that doesn't shock me at all. I would've done the same thing if I had a Game Gear! 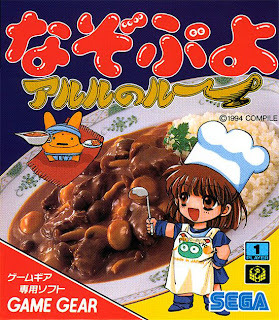 I love that Nazo Puyo Puyo cover art with the curry, which I have never seen before. 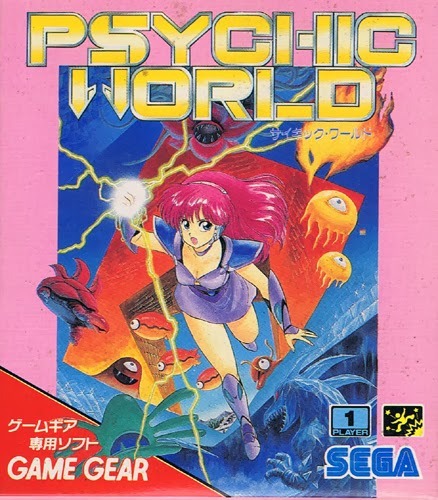 The best part is that they could have put an animated picture of curry in the background but decided to go with an actual photo of curry, which just totally demolishes the conventions of video game cover art from those days (and today too I guess)! Well, I'm glad I could introduce you to it, too, Sean. And, yes, the fact that it includes an actual photo of a plate of curry in the background makes the whole thing, IMO. Combine that with the adorable illustrations and the great use of color, and you've really got a winner! Introducing: Shall We Do It?